Disclaimer: our family used to be American Revolutionary War reenactors. I thought that this was an excellent historical. The idea of a family of today finding a prewar document is possible, and the parallel voicing of today and then is very well done. The characters are interesting and engaging and quite believable. Good for nearly any age. The choice of narrator is interesting, but as I loved listening to him that says it all. I requested and received a free review copy. 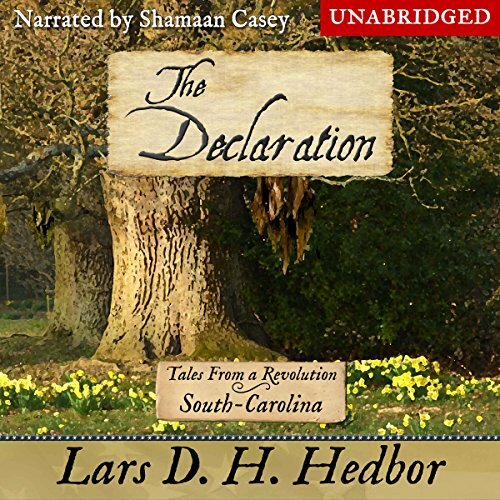 Where does The Declaration rank among all the audiobooks you’ve listened to so far? I always enjoy a good historical fiction and this one was definitely a fun one. I'll admit that when it started I wasn't sure if I would like it... the narrator's very deep voice (reminiscent of James Earl Jones) was an adjustment for me- didn't fit the initial characters- but as I got deeper into the story it all fit together. I thoroughly enjoyed this story and highly recommend it. The story pops back and forth from current time and the Revolution Era and each is so well developed that you look forward to the switches between them wanting to know how each turns out. When I first started listening I didn't think I would like the story but as I continued to listen and delve into the Harris story I became more involved with the characters and the story. I liked how the story went back and forth from what was happening now to what happened in the past. The narrator was very good and kept me listening well into the night so I could get to the end of the story, Good history lesson. An enjoyable historical fiction. The story follows the Harris family and alternates between the past and present timelines. I liked how everything came together and the decisions in the past affected future generations. This story is set in both the past and the present. We follow a present-day grandmother and granddaughter as they find a copy of an old paper up in their attic. It was kept safe for many generations and finding it has a huge impact on their lives. We also follow the story of their ancestors during the time prior to the writing of the Mecklenburg Declaration. The colonists, due to the horrible treatment by the British troops, band together to fight back and protect their own. Our main character joins the Committee of Safety’s patrol. We get insight into the plight of his family and other colonists. We also get a glimpse into the hardships endured by the slaves on the tobacco plantations. Many colonists suffered injustices under the British, but many more slaves suffered by the hand of the British soldiers and the colonists. I read / listen to a lot of historical fiction and I found it unique that the main family is not inserted into pivotal roles or conveniently by the side of those that made the Declaration. They are everyday people doing what they feel is right to survive. That makes this book read more like a historical biography than fiction. I thoroughly enjoyed it. This is the first book I’ve listened to by this author and I will look for more! A lot of research went into this book. Narrator did a great job voicing this book. Distinct voices were used for each character and the female voices were well done. He did everything from a young woman, to grandmother, to a deep voiced man. His cadence was very pleasant. I’d love to listen to another story by this narrator. liked the book. the narrator did a good job. I will look farward to listening to more of his work. I enjoyed listening to the narrator. I enjoyed how the story went back and forth from the time of the writing of a document and the time when the document is found.